The last time Quiet Slang– the stripped down, desconstructed configuration of Philadelphia punk group Beach Slang- played Nashville, it was out of necessity. 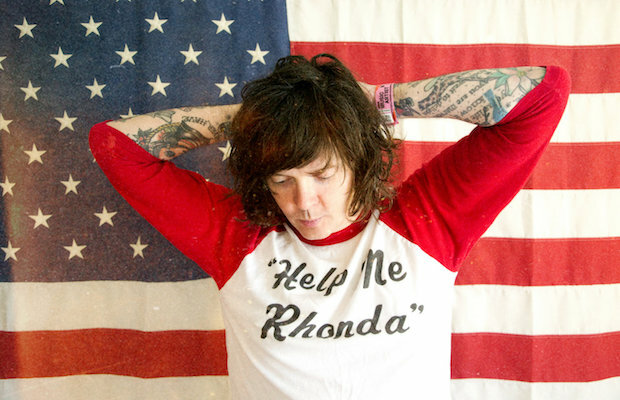 Shortly before a national tour, the band shed several members, and singer James Alex was forced either to drop off or carry on, opting for the later, reworking Beach Slang’s material as a solo performer, and giving birth to Quiet Slang. Now with both an EP and an LP out under the stripped down moniker’s name, Quiet Slang return to Nashville June 5, this time by choice, to play The High Watt, along with up and coming alt rocker Abi Reimold. Beach Slang proper are still touring as well, but for fans or newcomers alike who want to soak in their earnest brand of punk in a more intimate and stripped-down setting, Quiet Slang is a very cool project to experience. Tickets are still available here, but we’re also giving away a pair of tickets to one lucky fan! Read on for more about the show and enter for a chance to win below. Led by frontman James Alex, Philadelphia’s Beach Slang co-opt elements of punk, heartland, and indie rock, playing with an energetic earnestness that feels like a love letter to classic punk without entering the territory for full-blown nostalgia. With a sound is both fresh and familiar, it’s no surprise that they’ve racked up endless critical praise from so many tastemaking media outlets and punk fans, and quickly ascended to scene mainstay. Formed in 2013, the group made an amazing amount of headway with only a few songs to their name, Alex’s style compared to the great Paul Westerberg, and, fueled by enough initial positive response, toured extensively long before releasing an album. Their genre-bending sensibilities have earned them a place in the more pop punk and emo-geared side of the scene, performing comfortably alongside both more contemporary and trendy acts, as well as more underground and old school ones. Beach Slang’s full-length debut, The Things We Do to Find People Who Feel Like Us, ranked among 2015’s best, most underrated gems, and 2016’s followup, A Loud Bash of Teenage Feelings, managed to find even more confidence, vulnerability, angst, and earnestness; not just one of this year’s beat, but also one of the strongest sophomore efforts in recent memory. After a bit of a live lineup shuffle a couple years back, the group found their ranks temporarily thinned, and James opted to perform an already-booked tour by himself, in an acoustic configuration he dubbed Quiet Slang, which led to a an EP, We Were Babies & We Were Dirtbags, under that same moniker. Beach Slang have since become a full band once more, and continue to tour as such, but Quiet Slang proved to be a popular new way to deconstruct the group’s personal and resonant songs, and has continued on, leading to a proper full-length, Everything Matters But No One Is Listening, earlier this year. A powerful live force, Beach Slang are as fun, unpredictable, and emotionally charged in person, and Quiet Slang, while certainly more subdued, rivals that experience in a more intimate and personal presentation. Springing from the Philly DIY scene in 2014 with her first EP, Forget, alt rocker Abi Reimold adopts a personal, emotional, earnest style that should resonate well with Beach Slang fans. Reimold released her full-length debut, Wriggling, at the start of 2016, produced by Mumblr drummer Scott Stitzer, met with critical praise and strong buzz from within the indie scene. She’s continued to tour and attract attention since, and should be due to release new music in the near future. Be sure to show up early! Winner will be announced Tuesday, July 3 at 12 p.m. CDT, and will receive one pair of tickets. Good luck! Win Tix to Quiet Slang at The High Watt! Quiet Slang and Abi Reimold will perform Thursday, July 5 at The High Watt. The show is 18+, begins at 8 p.m. (doors at 7 p.m.), and tickets are available to purchase for $13-15.